Under the creative direction of Issac Selya, Founder and Artistic Director, QCCO, and WSC members providing support in set design and construction, marketing and promotion, stage direction, and prop development. Fully staged, with full orchestra. 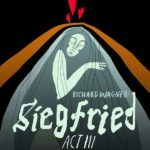 Don’t miss this exciting production of Wagner’s Siegfried, Act III! Tickets: http://siegfried3.brownpapertickets.com/. Use the code “happy203rd” before 12:00 am on May 24 for 18% off balcony tickets or 16% off ground tickets.